The Oslo Governance Centre (OGC) supports research and policy dialogue on how violent conflict can be prevented and peace sustained, under the project 'Forging Resilient Social Contracts'. 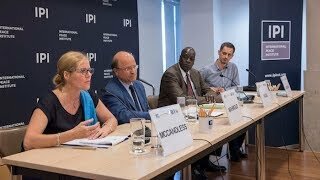 The analysis of what drives resilient national social contracts – how they are understood in different contexts, how they manifest and adapt, and how they can help advance the policy and practice pathways for achieving and sustaining peace has contributed to revitalizing the social contract concept. Simultaneously, it has resulted in increasingly engaged participation of all stakeholders. The country case studies, subsequent comparative analysis and dialogue help explain how a more nuanced understanding of national social contracts is particularly valuable for policy makers. A partnership between UNDP’s OGC, the Julian J. Studley Fund of the Graduate Program of International Affairs at The New School, and the Friedrich-Ebert-Stiftung – Berlin and New York, the project currently focusses on 11 countries: Afghanistan, Bosnia-Herzegovina, Colombia, Cyprus, Nepal, Somalia, South Africa, South Sudan, Tunisia, Yemen and Zimbabwe. The project has also received the Rockefeller Foundation Bellagio Center Award. It is currently based at the University of Witwaterstrand in Johannesburg, South Africa. With UNDP OGC support, several publications and case studies are being produced. The research findings have been shared in different countries, and some key high-level meetings and events such as the Geneva Peace Week, the World Bank Fragility, Violence and Conflict Forum and UN High Level Event on Sustaining Peace. Project Synopsis - New School International Affairs - Forging Resilient National Social Contracts.